There are many exciting biological research projects going on at Cathedral Cave Preserve. An early discovery was the Townsend Long-eared bat maturnity colony roost.This colony was first documented in 1960, but since we have gated the cave in 2004 and limited the summer human access, it seems that the colony has increased in size. Another interesting animal using the caves is the Javalina. In 2005 we had nesting Javalina produce a litter of five pups in Indian cave. During wet periods we have also encounted up to five Tiger Salamanders living in Cathedral cave. One of the most exciting find was the discovery of a new genus and species of millipede. 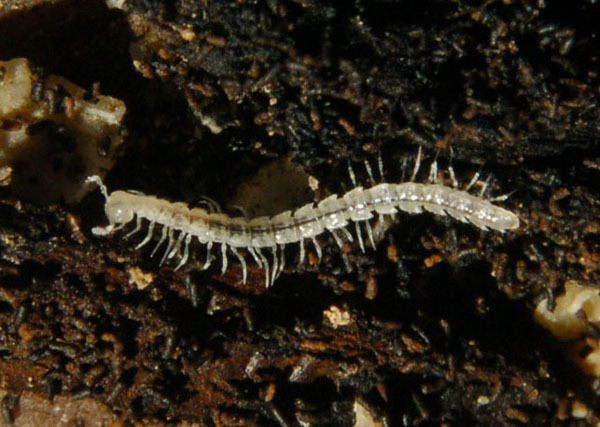 The millipede was first discovered by BLM cave specialist Doug Powell. Samples were then to Dr. Bill Shear for identification and naming.